There are loads of advantages to the job that I choose to do for a living. Teaching music from home, my commute usually involves walking to the bottom of my staircase and into my music room. I have no boss or anyone else to answer to. I choose my own working hours and take time off whenever it suits me and my family. I manage my own work / life balance and work as much as I feel is appropriate. I think about music, play instruments and sing every day of my life. And, I get to spend every working hour supporting people in their own musical journeys. With all these pro’s, of course, come a handful of con’s – the lack of a guaranteed income, no sickness benefits or holiday pay, the occasional encroachment of work life on my home life… but, most of these are common to anyone who is self-employed. One negative aspect that my peers often cite about my situation are the unsociable working hours: teaching guitar at the weekend, conducting a choir a 9 o’clock in the evening etc. But, there’s more to it than this: actually, like with most working patterns, I have got very used to teaching or rehearsing in the evenings and at weekends. And, some of the best parts of my job happen during these ‘unsociable’ hours. This past weekend is a case in point. Most people who do the 9-5 routine have Saturday and Sunday to recover. I teach from Tuesday to Saturday each week, with a break on Sunday and Monday. But, this past Sunday was the date of my student’s charity concert. More than 20 performers gathered at St Andrew’s Church Hall on Newmarket Street in Skipton to perform to one another in aid of a good cause. Some brought cake, while others helped set the room up and work on the door etc. And, there were some brilliant performances: everything from jazz and blues piano to people singing pieces from musical theatre. The finale involved five of my young students singing an ensemble piece: When I Grow Up from the musical Mathilda. 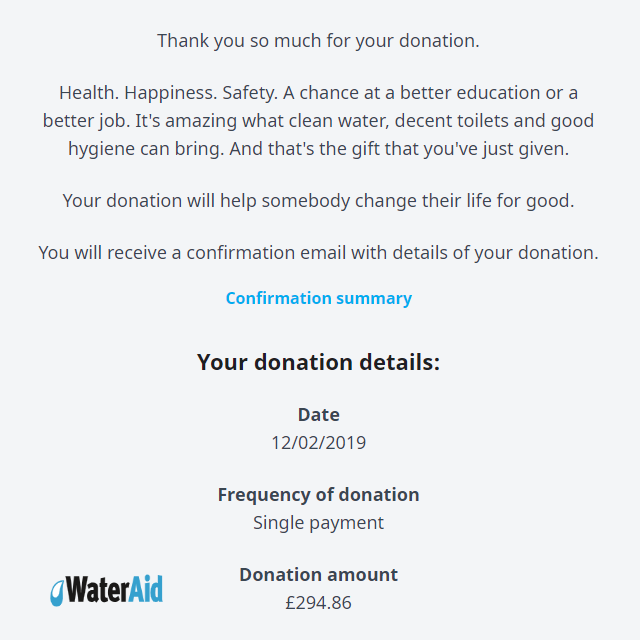 And, their efforts paid off: everyone there were entertained for the best part of two hours, and a total of £294.86 was raised for WaterAid – a charity that works to make sure the poorest people around the world gain access to drinkable water and clean, safe toilets. What an amazing achievement!! Then yesterday (my second ‘day off’) came my second concert of the weekend. This time, it was the turn of the Carleton Ladies Choir to perform. 18 singers, a pianist and myself all trooped up to Malham to entertain an over-60’s group. We gave renditions of 14 songs, including some WWII numbers to which the audience enthusiastically sang along. Everybody there gave their time on a Monday afternoon voluntarily and we walked away having had an extremely enjoyable time. The venue was Malham Chapel, a newly refurbished building that was bathed in sunshine through the whole afternoon. Oh, and yesterday also happened to have marked 6 years to the day since I took over as Musical Director of the group. What a great way to celebrate the anniversary! So, technically, I haven’t had a day off as such this week. But, I feel that organising these events is worth the sacrifice and then some. Well done and thank you to everyone who was in any way involved with these two wonderful events.